Aviation Regiment 4020 was founded in October 1959 (or 1961 according to Ref.2), with the arrival of a squadron of MiG-19PMs. These aircraft were operated in the all-weather interceptor role for the defence of the capital city. In 1965 the MiGs were swapped for Chinese-built Shenyang F-6 (MiG-19S) aircraft, which are day interceptor fighters. Regt 4020 was formerly known as 7594 Regt, before it was renumbered in the early 1990s. In late 1970 the unit introduced the F-7A into Albanian Air Force service, before responsibility for F-7A operation was transferred to 4010 Regiment in March 1974. Flying operations were suspended during the Kosovo Crisis in early 1999 to allow an airlift of aid to be delivered to the region. In 2002 two F-7As and four FT-5s replaced one of the F-6 squadrons. The Rinas Air Wing (Krahu Ajror) is planned to operate only three FT-5s and four Y-5s from 2006. 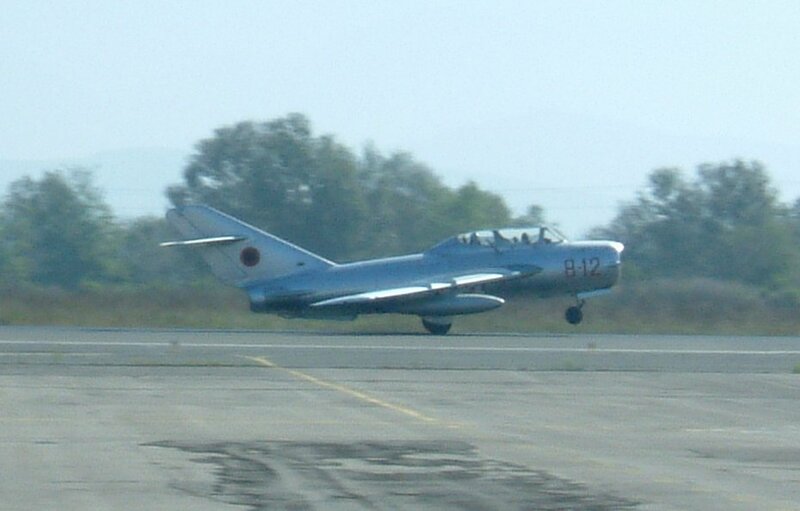 MiG-19PM 12 Oct 1959 - 1965 ? MiG-15UTI/FT-2 2 1959 - 2002 ? Shenyang F-6 10 1965 - late 2004 ? FT-5 2 2002 - Present ? This unit has operated the Il-28 and H-5 in the bomber and target-tug roles, the Il-14 in the VIP transport role and a number of fighters in the interceptor role. In 2002 this unit lost it's F-6s in favour of F-7A and FT-5 aircraft transferred from Gjader in 2002. Il-28 1 1957 - 1971 ? Shenyang F-6 10 1965 - 2002 ? This squadron was responsible for introducing the F-7 into service. It probably acted as a Operational Conversion Unit (OCU) for F-6 pilots. It was transferred in 1974 to 4010 Regt at Lezhë-Zadrima (Gjadër), when construction of that air base had been completed.